Benthic foraminifera are single-celled organisms abundantly found in all kind of marine environments from brackish estuaries to the deep ocean basins at all latitudes. Foraminifera are covered with an organic test which accumulate in the sediment and make up a significant amount of sedimentary rock. Many species have well defined salinity and temperature preferences making them particularly useful for reconstructing ecological changes occured in the past. The fossil tests not only used for paleoenvironmental interpretition, but also for biostratigraphy and age-dating. Anthropogenic pollution or environmental factors may cuase abnormal development of the test, such as aberrant chamber shape and size, twisted or distorted chamber arrangement, multiple apertures, twin, triplet and even quadruplet forms. These abnormalities are commonly used as indicators of pollution. 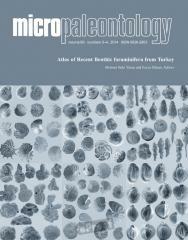 Many researchers have studied the recent benthic and planktic foraminifera of the Mediterranean fauna. The studies have investigated the distribution and abundance of the species, composition of the foraminiferal assemblages, ecological factors and interractions of tests with the substrate. Recent studies, mainly focused on the alien species and their ecological impact. Despite the numerous researches, there is a lack of a comprehensive illustrated guide to the Mediterranean foraminifeal fauna, except the “Mediterranean Foraminifera” (Cimerman and Langer 1991), which included samples from Adriatic and Tyrrhenian Seas, representing mostly the western Mediterranean fauna. With the presented SEM photos of 299 species in 84 plates, the aim of the present Atlas is to fill the gap and provide an updated checklist of foraminiferal fauna of the Turkish coastline, representing the majority of the Levantine Basin.